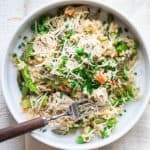 This 30 minute recipe for One Pot Chicken and Brown Rice with Spring Veggies is favorite weeknight meal for my family. My kids loved it! And I was so happy because it’s whole-grain and each portion has two servings of vegetables and lean protein. It’s a complete meal and there’s only one pot to wash! It’s gluten-free and only 264 calories per serving. Can you feel my smile beaming through the computer screen? I am so happy because this week has really felt like spring! Finally! We’ve had nice warm temps during the days, and lots of sunshine. I feel the end in site! Grilling weather, short sleeves, walks with the dog without worrying about cold paw. I am also looking forward to the annual game my girls and I play when driving to and from school, activities etc, we compete on who can first call out when we see road-side daffodils. When the pale yellow blooms are spotted, it’s a race who can yell “Daffodils!” at top volume. It’s sort of like Punch Buggie, except more springy and less violent. For a while we also had a shoot off game which was “Shad Tree!” They’re a native flowering tree, that have white bottle brush blooms and can be seen on the mountain sides before the leaves come out. Ahh, I love seeing the shads blooming because you know the leaves are not far behind! 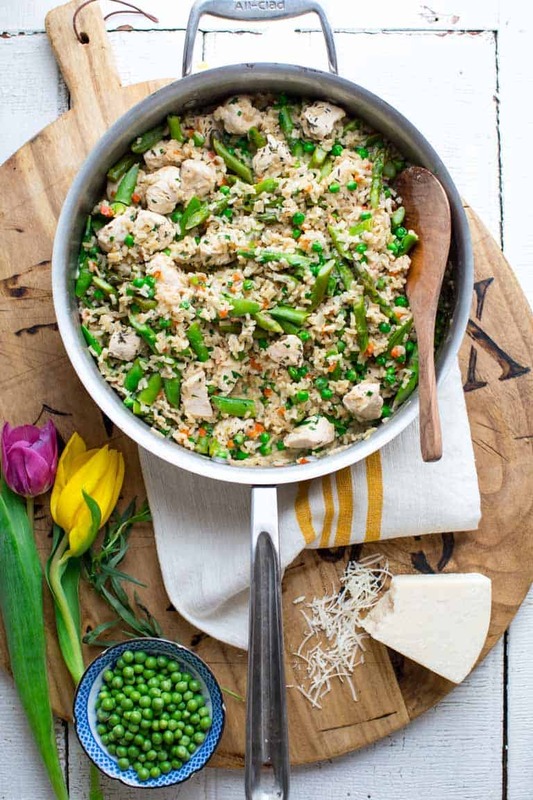 The evenings are still chilly enough that a hot meal like this One Pot Chicken and Brown Rice with Spring Veggies is a welcoming comfort. I’ve been playing around with the formula for a couple weeks, and my kids absolutely love it. It is loaded with veggies, so that is a big plus. Start with Easy Seasoning: I used a combination of olive oil and butter. Only a little of each, and then sizzled shallot and red pepper and some thyme to create the base of the flavors in the dish. Organic Chicken Breast: Next I added in a pound of cubed organic boneless skinless chicken breast. The chicken gets coated in the thyme and seasoning from the shallot mixture, so it really makes it much more flavorful. Quick Cooking Brown Rice: Once the chicken is no longer pink, I added in chicken broth and quick cooking brown rice. 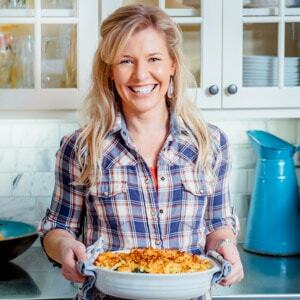 I used to use quick brown rice all the time when I developed recipes in the EatingWell test kitchen. But I have never used it here on the blog. I think I forgot about how dang easy it is. And it’s not sketchy at all ingredient wise. It’s just rice that is cooked and dehydrated. So basically when you cook it, your just rehydrating it. That’s important for this one pot dish, because the chicken would otherwise totally over cook if you were using regular brown rice. I added in a ton of veggies: snap peas, sweet peas and asparagus. You can used fresh shelled peas or frozen and thawed. Both work great. Trader Joes has shelled fresh peas, and they were so easy to use in this. To make it creamy, I stirred in some cream cheese and Parm at the end, plus chives and tarragon. 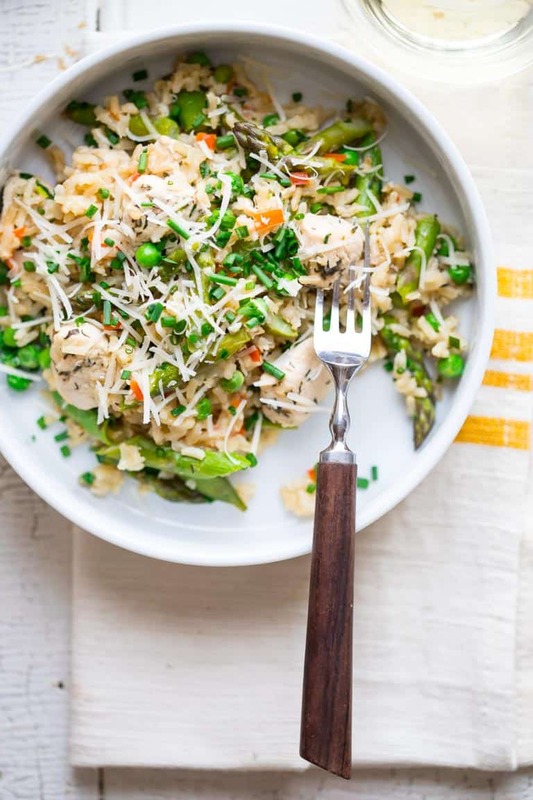 It tastes sort of like risotto, but it is so much easier! How is the spring progressing where you live? Do you play any car games with your kids? 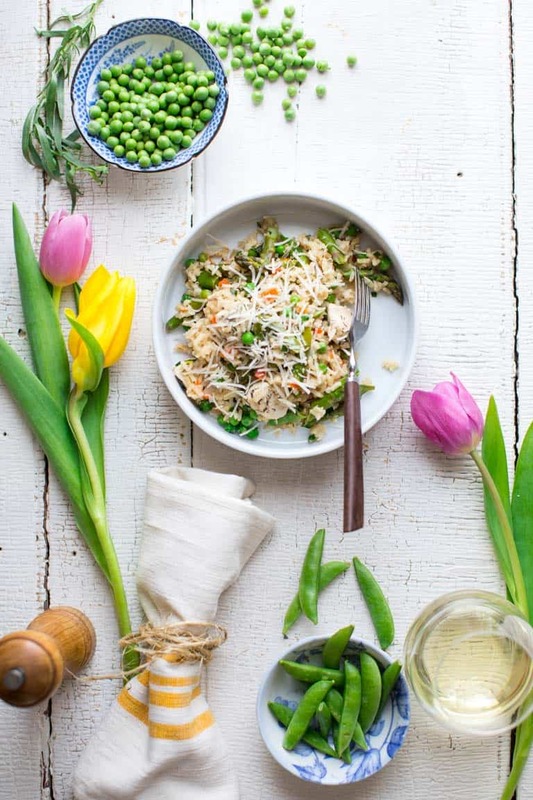 Have you ever cooked with quick cooking brown rice? 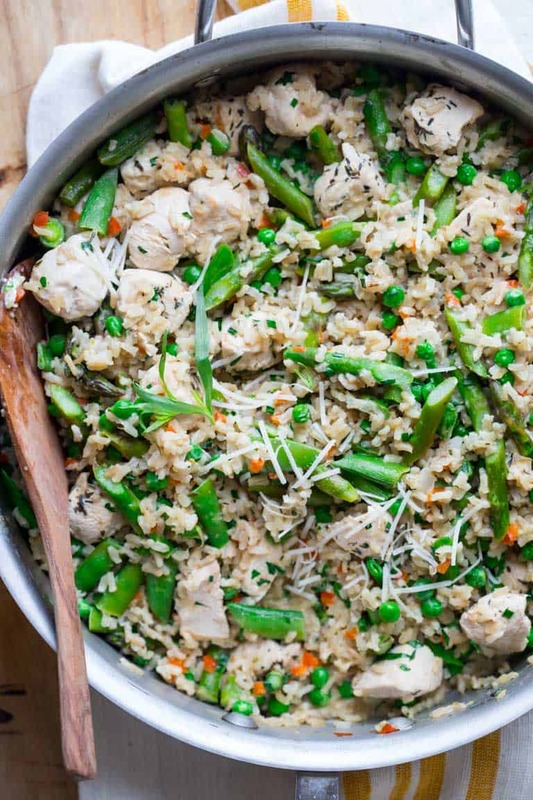 One Pot Chicken and Rice with Spring Veggies, ready in 30 minutes and naturally gluten-free. Heat oil and butter in a large skillet or straight-sided sauté pan over medium-high heat until the butter is melted but not browning. Add the shallot, red pepper and thyme and cook, stirring often until the vegetables start to soften, 1 to 3 minutes. Add chicken, and cook, stirring occasionally until the chicken is no longer pink, 4 to 6 minutes. Add broth, brown rice and salt, and bring to a simmer, stirring occasionally. Cover, reduce heat to medium-low to maintain a simmer, and cook until the rice has absorbed most of the broth, about 5 minutes. Remove lid and increase to high. Stir in cream cheese until melted. Add asparagus, peas and snap peas on top. Make sure mixture comes back to a simmer, then cover, reduce heat to medium-low and let cook 3 minutes. Remove from the heat, without removing lid and let sit 3 to 4 minutes or until the rice absorbs the liquid and fully softens. Before serving stir the vegetables, ¼ cup Parmesan, chives and tarragon (or chervil) into the rice to combine. Serve with additional Parmesan if desired. I love one pot meals! This look so perfect for weeknight dinner. 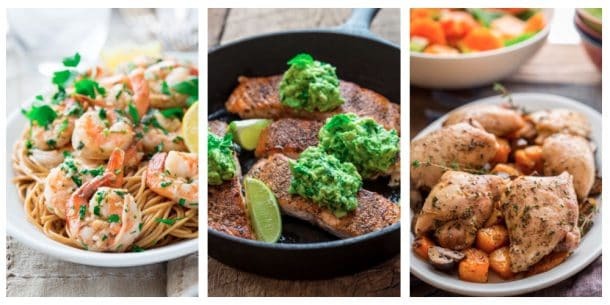 Weeknight dinners can be a struggle. Thank goodness for one pot meals, right? Thanks for coming by today Hayley. Have a great week. This seriously looks/sounds like the perfect dish to kick it off. Bright flavors that still offer some coziness. It felt so dreamy to leave the house in a vest today! It really is coming, slowly but surely! The dish looks so comforting and beautiful in the photos. The flavors are simple yet elegant! Hi Sonal. Thank you so much. I am glad you think the pictures are pretty and I appreciate the compliment. Thank you! Looks like my kinda recipe! Count me in for all the color! Hi Liz. Glad you like this too. I hope you’re well my friend. I love, love, love this! Looks like the perfect way to enjoy spring…especially when spring is having a hard time coming around and staying! Just made this. So good I’m writing here instead of finishing my next bite. Decided to make this last minute so had some random substitutions (broccoli instead of the asparagus and snap peas). So so SO Good. So good. Family favorite for sure. I am so glad you came back to leave a review Jenni! I appreciate it so much when folks do that. Glad it worked out with your subs and that you’ll make it again! Holy smokes, just made this with the kids (8 & 11). They did most of the work while i read (and re-read!) the recipe. It was SO GOOD! I can’t believe we did it. Thank you Katie, made for a wicked special dad night with the kids. Thank you so much Rich! I am so glad it worked out (and the kids did most of the work!) How fun and yay for Dad nights.